Spaghetti Warehouse Stuffed Bruschetta is an easy appetizer to prepare. In fact, it is hearty enough that you could eat it as a meal. Love a salad Caprese? 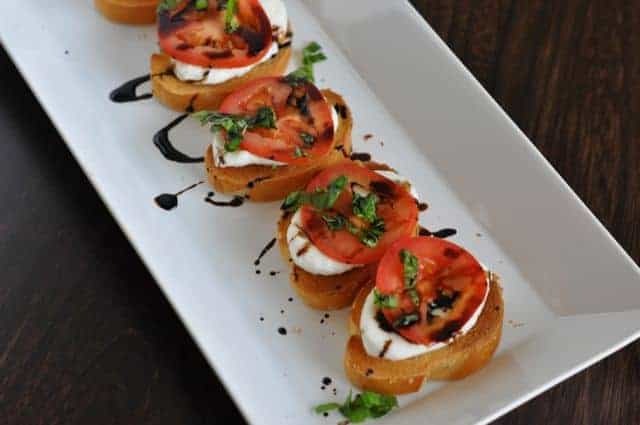 You will love this Caprese inspired bruschetta. The Spaghetti Warehouse is known for their amazing homemade sauces and their hot sourdough bread that is served with every meal. They also make some wonderful appetizers, and this Spaghetti Warehouse Stuffed Bruschetta is no exception. Made with Baguettes, fresh Mozzarella cheese, fresh basil, and a balsamic vinegar reduction. If you haven’t done a lot of cooking this recipe is very easy to prepare for the novice chef. Spaghetti Warehouse Stuffed Bruschetta is so easy to make. Slide baguette into 3/8 inch slices. Use the broiling feature in your oven to toast the bread. Turn the broiler on high, places the baguettes on a cookie sheet, and broil until the bread begins to turn brown. Remove cookie sheet from oven, then flip over and brown the other side. Slice the basil into tiny little strips by rolling several leaves together. Assemble by placing a piece of the toasted bread onto a plate, add a thin slide of Mozzarella, then a thin slide of tomato, top with basil. Drizzle with balsamic vinegar reduction. Need just a tad pure virgin olive oil drizzled on the bread and it would be perfect.